This new family home, designed by US architecture practice Shulman + Associates and located in the heart of Miami’s Coconut Grove, elegantly brings together the man-made and the natural. The approach was dictated largely by the setting itself. A lush tropical basin - technically a solution hole, an earth formation found in the Florida landscape - absorbs a quarter of the property’s total area. The main volume, camouflaged by trees, sits alongside this feature (its historical value dictated where the house could be placed within the site), while a glazed living room pavilion cantilevers above the wild garden. The rear of the house, meanwhile, extends onto a landscaped and manicured hardscape of lawn and pool. This sense of contrast continues inside the four-bedroom, two-level house. Strategically placed with the spaces are pieces from the client’s art collection. These artworks, such as a painting by Peruvian artist Fernando de Szyslo, enrich the interiors and are framed and highlighted by dark interior accents of grey marble and oak flooring. Precisely designed angles and niches dictate views and create focal points, in turn balanced against the landscape. Externally, elegant timber cladding provides an efficient rainscreen, while mirroring the colours of the landscape. Environmentally friendly strategies also helped define the design. 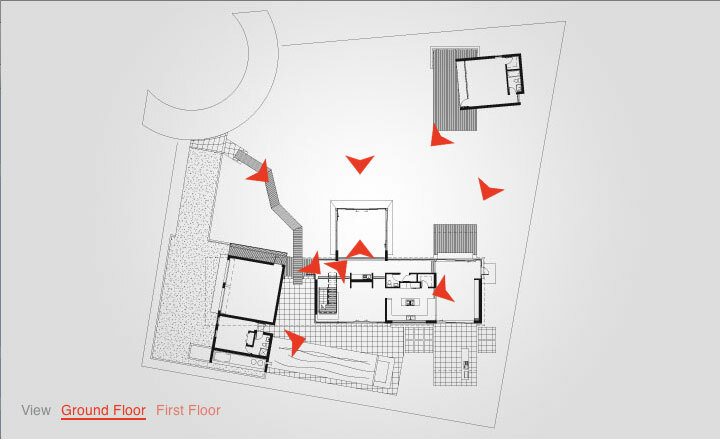 A breezeway on the ground floor helps balance wind gusts, while the unique positioning of the first floor volume captures currents from nearby Biscayne Bay. The home’s graceful design approach, which combines nature and architecture, is a reflection of the practice’s overall work. Founded in 1996 by Allan Shulman - a prolific author, practitioner and associate professor at the Miami School of Architecture - the Miami-based firm has grown to win over 70 design awards.